It’s been called the “Success Differentiator”. Those with it have more enthusiasm and more drive. And they experience lifelong results that are simply astonishing. Those without it usually work for those who have it. Do you think ambition is something you were born with and, therefore, can’t learn? Well, I’m here to tell you that’s simply not true. How right he was. You can want something. Long for it. Even see it happening in your mind’s eye. But if you don’t have the ambition to go out and get it, it will never be yours. Like that wingless bird, your dreams will remain forever grounded. Never taking flight. Never becoming real. Without ambition. Ambition is the driving force within you that turns hopeful wishes into reality. Yet it is also a quality that is widely misunderstood, overlooked, and undervalued. Fearful of being seen as greedy or selfish, people tend to avoid the appearance of ambition. As a result, while almost everyone possesses the seed of ambition within, very few take the time to nurture, develop, and hone this priceless skill. True ambition is creative and constructive; it’s the fuel you need to achieve and make a difference. Furthermore, when you don’t strive to be as ambitious as you possibly can be, you damage your own positive sense of your self, your worth, and your confidence! World-renowned success philosopher and motivator Jim Rohn spent most of his life studying the secrets of ambition. In his highly acclaimed audio program The Power of Ambition, Jim dispels the myths and crystallizes the individual elements that make up the force we know as ambition. Then he gives you specific tools and strategies for developing this all-important quality within yourself. When you combine Jim Rohn’s profound yet practical ideas with his skills as a master storyteller and speaker, you cannot help but be inspired to action as you absorb his foundational principles of success. You are guaranteed to come away from The Power of Ambition with renewed enthusiasm, increased drive, and a genuine itch to get out there and achieve your long-held dreams and inner ideals. You’ll find yourself becoming more enterprising, more creative, and more disciplined in pursuit of the things you want for yourself and for others. Turn hopes into reality. Turn ideas into action. I want to invite you to experience this landmark program risk-FREE. Listen to all 12 lessons on six CDs. Play them as often as you like. Watch your ambition grow... See the treasures you want... Bring them into your life with this unstoppable force. If The Power of Ambition isn't one of the most motivating and inspiring programs you’ve ever heard, you can return it at any time within one year for a refund or an even exchange. Many people struggle to earn a living. A much, much smaller number of people build and enjoy a fortune. Those who do have learned to take the spark of ambition that lies within them... and turn it into the fuel that drives them ever forward. If you're ready to ignite that spark within YOU, I strongly encourage you to order The Power of Ambition today! P.S. As a Nightingale-Conant subscriber, I’m sure you have an ample amount of ambition. But just imagine what you could accomplish in your life if you were able to significantly ratchet-up that ambition! Jim Rohn lived a long, ambition-filled life. It was a gift that delivered extraordinary results. Today, we’re passing his gift on to you. YES! I want to benefit from a continuous flow of high-level ambition. Not only will it bolster my enthusiasm and drive at home and work, I’ll experience astonishing results. 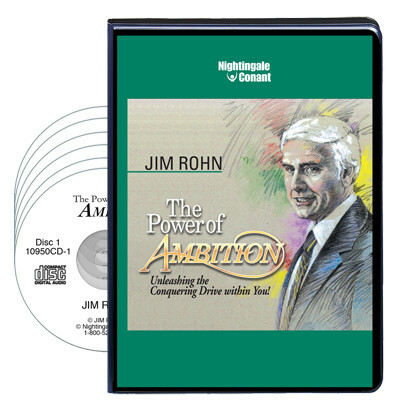 Please send me Jim Rohn’s bestselling 6-CD audio program The Power of Ambition today for just $46.95, which is 80% off the regular retail price. Take advantage of this limited-time special discount now! If your new level of ambition doesn’t catapult you to new heights personally and professionally, I can simply return the program in the next 30 days for a full refund. No questions asked.